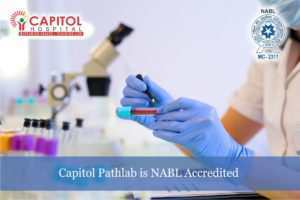 Capitol Pathlab is NABL accredited which supports physicians at Capitol Hospital by performing testing services for diagnostic and therapeutic evaluations. Thus, department of pathology has top of the line department equipped to provide comprehensive diagnostic support to its clinical counterparts. The laboratory teams consists of highly experienced pathologists, microbiologists, and lab technicians. Moreover, the department plays a specialized role in controlling hospital-acquired infections. Apart from providing state-of-the-art infectious disease diagnoses, it also provides consultative services for the clinical staff and physicians of the hospital and information to the entire support staff. Keeping the guidelines in mind, Capitol is applying and adapting cutting-edge technologies to meet these special requirements. All the tests are done on high end & fully automatic analyzers.